Whether you’re a hotel, airline, destination or car rental service, word-of-mouth marketing is crucial to the success of your business. When considering a purchase, 83% of people trust recommendations from family and friends. Nowadays a lot of that conversation is taking place online. From inspiration to reminiscing, travelers turn to social media throughout every step of their journey. Social media has a huge influence on travel-related purchases. In fact, of those who use social media to research travel, only 48% followed through with their original plans. 7% vacationed in a different country. Because the travel industry relies so heavily on word-of-mouth marketing, this is one trend you can’t ignore. But finding success on social media takes more than publishing postcard-esque pictures and announcing weekly deals on your social media channels. With a focused approach, travel brands can leverage word-of-mouth marketing to increase exposure and build stronger relationships with first-time and repeat customers on social media. Social media isn’t a standalone tactic. A successful social marketing strategy should be integrated with your business goals and target audience. Before you begin posting online, you need to develop clear and specific goals. Not only will this help to shape future campaigns, but it will also aid you in determining how successful your efforts are. Without some type of benchmark to compare your efforts to, you won’t be able to move your strategy forward. Remember to integrate. Consider how you’ll align your social media efforts to other marketing assets, such as your website, email newsletter and event promotions. Social media has reach beyond individual platforms, so always be thinking of ways to tie campaigns to other areas of your marketing strategy. If one of your goals is to drive website traffic, start sharing links to blog posts, landing pages and other content you’re publishing on social media. One of the first things you should do when creating a profile on a social network is add your website or blog URL to your bio or about section. Just as a traveler researches a destination, so too must you. Not only do you need to know who your target audience is, but you need to know where to find them. Never assume that you’re speaking to the general public. Although your goal may be to expand your reach and increase awareness, a five-star luxury hotel won’t find much success broadcasting to an audience of budget-conscious college students on spring break. 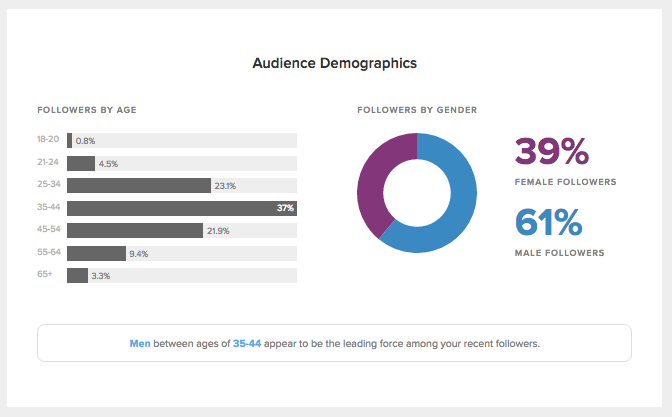 You can learn about the demographic makeup of your current social media following by using native analytics on platforms like Twitter and Facebook, or use a social media management tool. For deeper insight, you can connect your profiles to Sprout Social and see your audiences’ demographic data in your dashboard. You should also become familiar with the demographics of different social networks. Find out which platform your target audience is likely to be on and concentrate your efforts there. Once you have an idea of who’s following you online, you can begin to learn where they are active and focus your efforts on those networks. And don’t be afraid to experiment with new social media platforms. You have to go where your audience is. For example, Snapchat might not have appealed to Marriott Hotels at first, but we bet the company is glad it gave the app a chance. Marriott was one of the first travel brands to join Snapchat. It launched a three-month campaign in which four influencers traveled across key Marriott properties worldwide, taking suggestions from the audience and sharing their journeys on Snapchat along the way. The campaign resulted in more than 24 million views and increased awareness among a key demographic. Similarly, once you know who you’re targeting, you can begin to tailor content for those audiences. When developing a content strategy, a good place to start is to look at past posts to see what has performed well and what types of content your followers are engaging with. You can also develop content categories that you can cycle through, such as travel tips and customer stories. Regardless of where you fall in the travel-planning process (i.e., airline, hotel, rental car) you can still provide value throughout your customer’s journey. You may be only one item on a traveler’s checklist, but there are plenty of areas where you can become an invaluable travel resource. For example, many travelers connect with hotels ahead of their stay for dining and activity recommendations. In fact, the top reason guests contact hotels on social media is for local information, according to USA Today. Whether you’re a hotel or car rental service, by providing customers with useful tips about their destination, you’re showing that your interest in them doesn’t disappear the minute they walk away from your counter. Pinterest is a great destination for curating valuable content—just ask the Four Seasons. With profiles for its 81 hotels and resorts, the luxury travel brand curates travel, food and lifestyle content for its guests around the world. As a result, Four Seasons saw a 1,000% increase in daily average visitors and a 1,700% increase in daily average clicks to its website by using Pinterest. Today nearly 70% of searches related to travel begin online. But it’s not always a well-placed ad or vibrant image that invites travelers to click through. Remember you’re selling an experience, not just a seat on a plane or a bed to sleep in. So when creating your content strategy, focus on telling a story—but that story doesn’t have to be yours. Your customers are your best marketing asset. According to an Ipsos MediaCT study, user-generated content (UGC) is 35% more memorable and 50% more trusted than other types of media. What’s even better is that it’s so easy to come by. Everyone is a content creator. Our mobile devices have made it incredibly easy to produce quality images and videos. Today 72% of travelers post photos on social media while on vacation, and 76% post them after they return. User-generated content lets the customer be a part of the brand story. Airbnb made headlines in 2013 when it published the first short film made entirely of Vines. Over the course of five days, the travel brand challenged its community to use the Vine app to create six-second scenes about travel and adventure. The four-and-a-half minute video, which incorporates footage from 100 people, has received almost 400,000 views on YouTube. But of course, and we can’t stress this enough, always ask for permission before using someone else’s content. The exception here is if you’ve put out an official call for UGC by asking users to submit media using a hashtag or via email. You’re a travel brand, not the IRS. Your social media content should be educational yet entertaining, and most of all it should be fun. Creating a content calendar enables you to plan out months of quality posts ahead of time, but don’t let your content become stale. Make sure that you have flexibility for timely content, such as themed contests or sales, or conversation around a timely event—like spring break or holiday travels. It’s easy to think of social media as a broadcasting system and forget about actually being social. It’s not only about publishing. Social media is designed for two-way conversation, and social media listening is key when it comes to engagement. This is where a social media listening tool like Sprout Social comes in handy. Through features like Smart Search and Brand Keywords, you can search questions and phrases posted by existing customers and potential travelers. But don’t jump right into selling your services; try building a relationship first. A simple way to add value is to respond to a post announcing someone’s travel plans (especially those that involve your brand). You could ask what they plan to do once they arrive, what area of the state they’ll be in or simply let them know you’re available if they need help. Hyatt, for example, created a social media concierge on Twitter to personify the brand online and demonstrate the value it places on listening to its guests. The account is manned by a global team 24 hours a day, seven days a week. it launched in 2009, but by 2014 it had joined more than 50,000 conversations in a single year. Best of all, its response rate is an average of 10 minutes. And don’t be afraid to toot your own horn occasionally. Look at this example from Enterprise. A satisfied customer took to another Facebook Page to talk about her experience with one of the employees of the rental car brand. 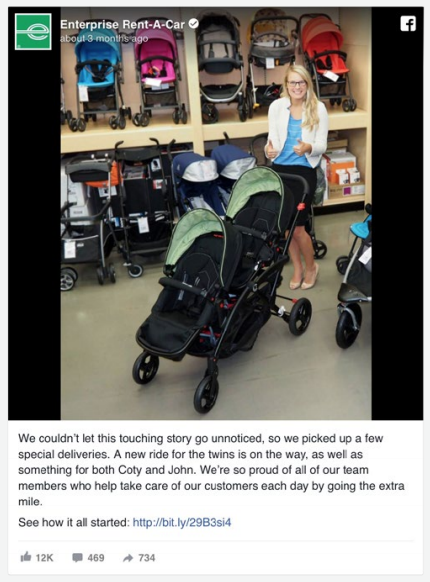 Not only did Enterprise comment on the original post (and receive a well-earned kudos as a result) but the company followed-up on the touching story with a post on its own Facebook Page. This prompted others to share their own experiences in the comments. Now of course not every social media mention will be followed by a heart-warming story, but it’s important to acknowledge the positive as well as the negative. Both are opportunities for growth. Remember: A lot can happen from the time a trip is booked to when the trip actually takes place. Your job isn’t over once a reservation has been made; it’s only the beginning. This might seem overwhelming, especially if you’re a small business team. If you have limited time or resources to spend on social, make engagement a priority. Respond to questions, comments and posts mentioning your business and look for relevant hashtags to find new conversations to join. The only way to know if you’re truly progressing toward your goals is to track your social media efforts. This is something you should be doing from day one, but if you haven’t, there’s no time like the present to start. By tracking and analyzing results, you’re able to prove that the time and resources you’re investing into social media is worthwhile. User-generated content and customer testimonials like the one highlighted by Enterprise above are free yet powerful marketing assets. If your goal is to drive website traffic, Google Analytics can show you how many social referrals led people to your website. Even better, by utilizing goal tracking in GA, you can see whether they led to someone actually booking a reservation. If you’re a travel brand with social profiles for multiple locations, manually analyzing metrics from native platform insights can be a very time consuming process. With Sprout Social, you can run weekly or monthly reports on everything from audience engagement to team performance. Yes, social media has a huge influence on the travel industry, but you don’t need to whisk anyone away on a dream vacation to find success. You don’t have to make a grand gesture because at the end of the day, all that matters is that you’re accessible to travelers. Be prepared to listen and prepare your customer support team. If you’re not sure where to start, check in with your existing customers and ask what they’d like to see more of and how they can feel like a bigger part of your brand.